At Dyalog we have long striven for both correctness and high performance in our implementation. However, our views on this matter have recently undergone an historic shift in paradigm which we are excited to share with our users. 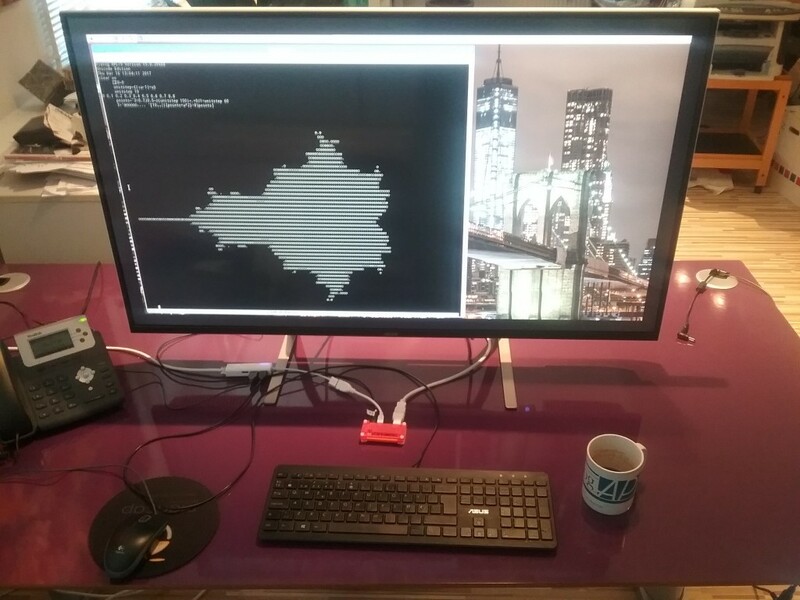 We now intend to provide the best experience to the user of Dyalog APL not by providing correctness and speed, but rather correctness or speed, with a user-specified tradeoff between the two. The upcoming release of version 17.1 includes a powerful new feature: the correctness–performance slider. 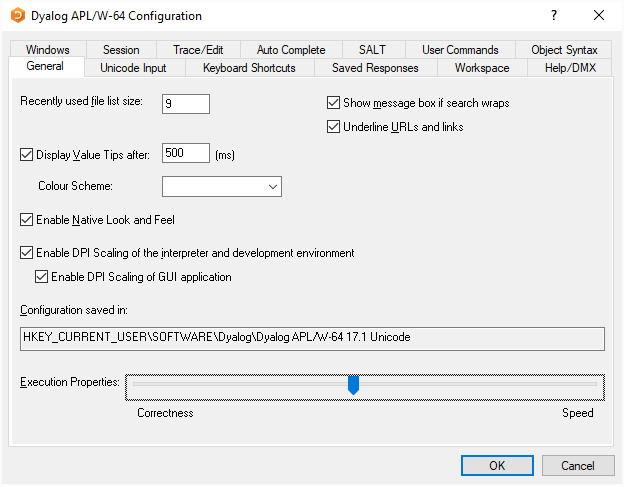 To find this option, select Options>Configure>General in the IDE, or Edit>Preferences>General in RIDE. The slider is labelled “Execution Properties” and may be set at any time, although users should note that the effective correctness may be reduced if this is done while an in-progress function is on the stack. With the slider at its default position near the middle, Dyalog will make an effort to balance performance and correctness. Computations will proceed at a reasonably brisk pace, and slightly wrong answers will appear occasionally while very wrong ones come up only rarely. As the slider is moved to the left, correctness is increased at the expense of performance. You’ll have to wait for your results but when you get them they’ll be numbers you can trust. Moving the slider to the right will have the opposite effect, increasing speed at the expense of more frequent misparsings and significant floating point error. Perfect for startups! The seasoned programmer has most likely experienced the same issues as us, and may already be rushing to incorporate our ideas in his or her own code. In the interest of transparency, however, we wish to explain a bit further our experiences with the speed-correctness tradeoff. Most often we encounter this tradeoff in one direction: when writing to improve the performance of a particular interpreter operation we sometimes find the results returned are different. In the past such cases were seen as bugs to be corrected, but we now understand them to simply be instances of a universal rule. Conversely, fixes for obscure parsing issues which slow down parsing of equally obscure but already correct cases are no longer cause for concern: we simply condition them on the appropriate slider threshold. In the graph below we plot the accuracy and performance of several algorithms to compute the inner product !.○ on two large array arguments. Performance is measured in throughput (GB/s) while accuracy is defined to be the cosine similarity of the returned solution relative to a very precise result worked out with paper and pencil. 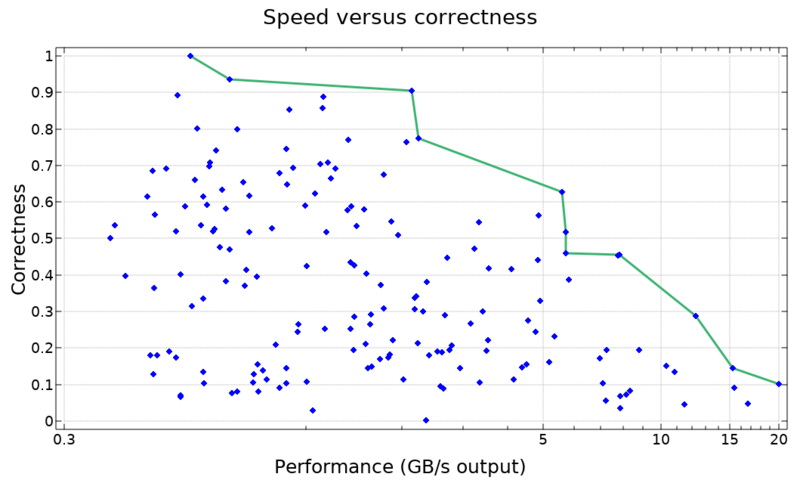 On plotting these results the nature of our plight became clear, and we added the performance-correctness slider to Dyalog version 17.1 as fast as possible. This post was written as accompaniment, with similar haste. We profiled a large sample program with many different execution settings and obtained the results shown below. 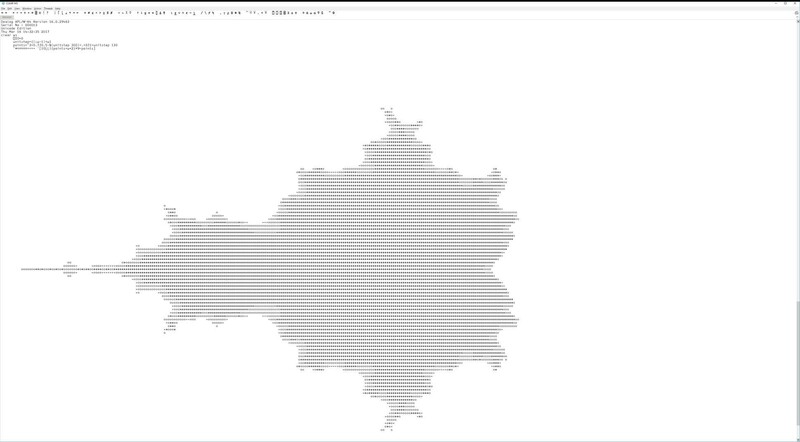 As you can see, Dyalog can be quite stable, or quite fast, depending on how the performance-correctness slider is set. We believe these results demonstrate excellent value for all of our clients. Large and conscientious businesses can set the slider to correctness to encounter very few errors in execution. Rest assured, if errors are reported with these settings, we will do our best to shift them to the right side of the performance-correctness continuum! In contrast, the APL thrill-seeker will find much to like at the speedy end of the spectrum, as more frequent crashes are compounded by an interpreter that gets to them faster. Although we believe the provided options will satisfy most users, some tasks require an implementation so fast, or so correct, that Dyalog cannot currently offer satisfactory performance along the relevant axis. To rectify this in the future we intend to offer more powerful facilities which extend the extremes of the correctness-performance slider. Potential clients who are exceptionally interested in correctness, such as NASA and Airbus, should contact us about an interpreter which runs multiple algorithms for each operation and chooses the majority result. For users interested in speed above all else we propose to offer an interpreter which only computes a part of its result and leaves the rest uninitialised, thus obtaining for example a 50% correct result in only half the time. Even more extreme tradeoffs are possible. For the most correct results we are considering an algorithm which adds the desired computation to Wikipedia’s “List of unsolved problems in mathematics”, and then scans mathematical journals until a result with proof is obtained. For extremely fast responses we propose to train a shallow neural network on APL sessions so that it can, without interpreting any APL, print something that basically looks like it could be the right answer. Such an option would be a useful and efficient tool for programmers who cannot use APL, but insist on doing so anyway. Although our plans for the future may be much grander, we’re quite excited to be the first language to offer user-selectable implementation tradeoffs at all. We’re sure you’ll be happy with either the correctness or the performance of Dyalog 17.1! That is, the pattern is “permute under cut”. Moving the ' ', into the permuting function, while shortening the overall expression, obscures this pattern. 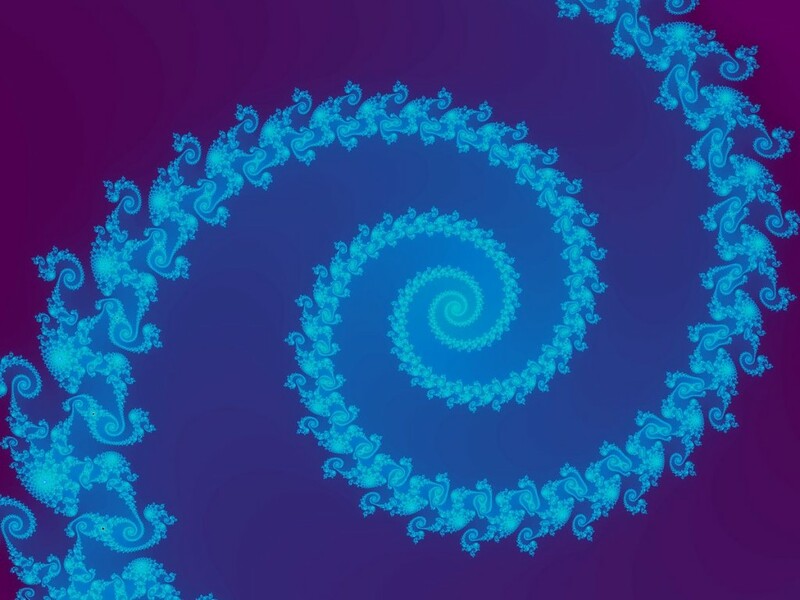 The question was then posed whether the algorithm can be “flattened” further; that is, whether the expression ∊p+?⍨¨n in function fe can be done without each. The answer is of course yes (else I wouldn’t be writing this blog post :-). Flattening, or avoiding the creation of nested arrays, has the potential to reduce memory consumption and increase efficiency, because there is more potential for the interpreter to perform optimized sequential or even parallel operations. In the old days, before general arrays, before the each and rank operators, ingenious techniques were devised for working with “partitioned” arrays: A boolean vector with a leading 1 specifies a partition on a corresponding array with the same length, basically what we can now do with ⊂ or similar facility. A detailed description can be found in Bob Smith’s APL79 paper A Programming Technique for Non-Rectangular Data. The last two sets of expressions illustrate how “partitioned plus reduce” and “partitioned plus scan” can be computed, without use of general arrays and without each. At issue is how to do “partitioned random permute”. Answer: ⍋(n?n)+n×+\p ⊣ n←≢p. There is a puzzle from 1980 which similarly involved randomly permuting items within groups. See A History of APL in 50 Functions, Chapter 47, Pyramigram. The puzzle solution is amusing also for that fact that it used -\. This “puzzle of the year” brings to mind Krypto, a game I played many years ago while in grade school. Krypto is a mathematical card game. The Krypto deck has 56 cards: 3 each of numbers 1-6, 4 each of the numbers 7-10, 2 each of 11-17, 1 each of 18-25. Six cards are dealt: an objective card and five other cards. A player must use all five of the latter cards’ numbers exactly once, using any combination of arithmetic operations (+, -, ×, and ÷) to form the objective card’s number. The first player to come up with a correct formula is the winner. The stricter “International Rules” specify the use of non-negative integers only; fractional or negative intermediate results are not permitted. For example, if the objective card were 17 and the other cards were 2, 8, 14, 19, and 21, then a Krypto solution can be as follows. Without loss of generality, we use APL notation and syntax. In this article we present functions to find all solutions to a Krypto hand. There are a maximum of !5 permutations of the 5 cards and 4 possibilities in each of the 4 places where an operation can be put, for (!5)×4*4 or 30720 total possibilities. This number is small enough for an exhaustive approach. The function perm is from the Dyalog blog post Permutations, 2015-07-20. perm n generates the sorted table of all permutations of ⍳n. The local variable a in Krypto is a 30720-row character matrix computed from the 5 non-objective numbers. It consists of all !5 permutations of the 5 numbers interspersed with all 4*4 arrangements of the four operations + - × ÷. Executing the rows of a produces a 30720-element numeric vector. Comparison of this vector with the objective yields a boolean vector that selects the rows of a which are correct formulas. We note that use of the @ operator, new to Dyalog version 16.0, obviates the need to name intermediate results for reasons for syntax. Instead, names are only used to break the code down into more comprehensible components. 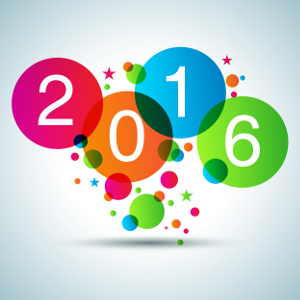 Our 2016 Year Game was launched in January 2016 and ran until the end of the year. The idea was simple – to find APL expressions involving exactly the digits 2 0 1 6 in that order to equal the numbers 0 to 100 using the fewest characters possible. The minimum number of characters for an expression is 5 (the four digits 2 0 1 6 and a single primitive function/operator) so the smallest number of characters that a possible solution can have is 505. The wonderfully varied ways in which APL can be used (and in which APL users think!) was illustrated beautifully by some of the solutions. Although some numbers were attained in the same way by everyone (36, for example, was always 20+16), others lent themselves to multiple solutions. No-one managed to calculate 100 in fewer than 7 characters, but the 7-character answers included 20∧⌹.16, 20×¯1+6, -20×1-6, 20×-1-6, ¯20×1-6 and various others on the same theme. Unity experienced similar creativity, with 1 being reached in the minimum possible number of characters (5) using ×2016, 201≢6, 20>16, 20≠16, 2<016, etc. It was clear early on that submissions fell into two distinct groups – those who wrote a program to find the expressions and those who derived their expressions manually. I found the creativity evident in the manually-derived solutions very satisfying; the results may not have been as terse as those resulting from programs, but the individuality of the creators shows people inspired by their subject matter. Who can fail to appreciate the thought process behind arriving at 96 using (×/+\+\(!2 0 1))+6 rather than the more prosaic ⌈⍟!20+16 or ⎕IO-⍨+⍨20+16 rather than 20+⌈○16 for 71? Having said that, the goal was conciseness and individual character counts are now tabulated on the 2016 Year Game page; an amalgamation of the lowest-character expressions that anyone achieved can also be downloaded from this page. Congratulations to Jonas Stensiö and Veli-Matti Jantunen, who both achieved the same character count as the amalgamated minimum (693). 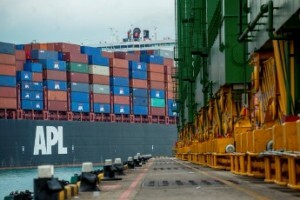 It’s APL…but not as we know it! 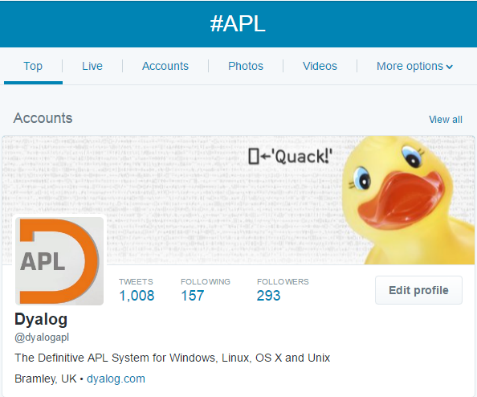 As the party behind Dyalog’s Twitter account I often search our feed for #APL or just APL to see if anyone is talking about us or APL in general and I am frequently surprised by what pops up. We have often had a giggle in the office over some of the things we find and it was suggested to me that others might find these interesting too hence this rather random blog post. Probably the most well known alternative APL is the container shipping and ocean freight company American President Lines (@APLShipping). The Dyalog staff often stand at the railway crossing on our way to the village bakery for lunch and chuckle at the APL containers whizzing past on the train … we are easily amused! My personal favourite other APL has to be Athletic Propulsion Labs (@APLrunning) with their ‘oh so gorgeous running shoes’ … their trainers are things that I desire on a daily basis!! For you non-shoe lovers out there, they are also the official footwear supplier for the Renault Sport Formula One team. 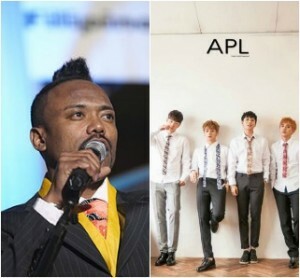 The APL alter-ego that comes up most frequently in my Twitter search is a musical one … it seems we also share #APL with a 4 member boyband from South Korea. This APL (@APL_world) is extremely popular with teenage girls from Japan and Korea who frequently tweet their undying love for the boys … it makes you wonder who thought it was a good idea to name a teenage pop sensation after a programming language! Still in the musical world we also have an uber cool APL namesake in rapper apl.de.ap (@apldeap) who is also one of the founding members of the Black Eyed Peas. Another APL that we are proud to share #APL with is the John Hopkins University Applied Physics Laboratory (@JHUAPL) in Maryland USA. 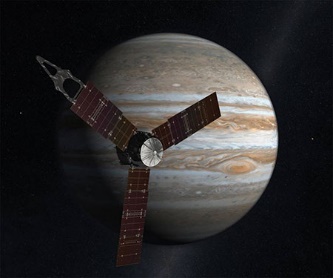 NASA’s Juno spacecraft successfully entered Jupiter’s orbit in July carrying an instrument suite that includes the Jupiter Energetic Particle Detector Instrument (JEDI) built by the Johns Hopkins Applied Physics Laboratory. 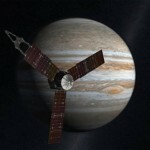 APL in space … how cool is that! The Association of Professional Landscapers (@The_APL) are the APL that fill my screen with greenness, tweeting some amazing photos of their garden and landscaping projects. 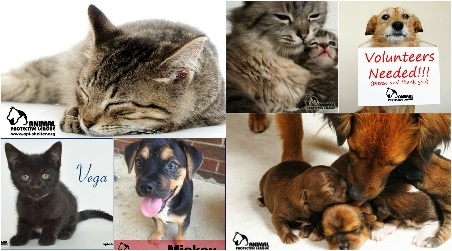 Finally, if you are having a bad day and just need cute puppies and kittens to coo over, the Animal Protective League (@APLSpringfield) in Springfield USA is the perfect APL for you. As well as providing cuteness overload they also do a great job re-homing animals in need. So there you go folks … a few of my favourite alternative APLs for your amusement. Of course there are lots of other APLs out there in Twitterland but frankly most them are just not that interesting … and a few, to spare your blushes, are just not the sort of thing we want to share!